This is just a short post in honour of Jaki McCarrick’s play, Belfast Girls, which opens this/next week (May 2015) at the Artemisia Theater in Chicago. Many of the orphans married former convicts which is hardly surprising given the history of the Moreton Bay settlement. Ray ‘s work however, shows much more than that. I was particularly interested in the support the young women gave each other, often turning up to each other’s marriages, as well as the differences between them. It is well worth a look. Ray has a good sense of historical context. After Surgeon Henry Grattan Douglas’s scathing report on the ‘Belfast Girls’ —they were, in his words, ‘barefooted little country beggars, swept from the streets into the workhouse, and thence to New South Wales…notoriously bad in every sense of the word‘--thirty-four (34) of them were sent straight to Moreton Bay and seventeen (17) to Maitland without setting foot in Sydney. In the John Oxley Library (Mss OM 68-18), in the James Porter Papers, there is an account of the Eagle steamer carrying orphans to Brisbane, towards “the latter end of 1849”. Obviously it’s not about our ‘Belfast girls’. In it, Porter claimed “about twenty of these girls were put on board as steerage passengers for Moreton Bay and although the lower classes in those days did not follow Paris fashions so slavish as now the girls to me presented a remarkable contrast. There (sic) hair had been cut short and the black fellow when he saw them for the first time in Brisbane called them “short grass” consequently they were afterwards called “short grasses”. Their dress consisted of a plain blue cotton cotton gown with white spots which hung loose from the neck to the feet. These were covered with heavy hobnail shoes”. I wonder if the ‘Belfast girls’ also had their hair cropped? It was a well-known form of punishment and humiliation for women in convict days. Perhaps the same attempt to control the Famine orphans was used by authorities? Let me post a couple of photographs and a few family reconstitutions relating to the ‘Belfast girls”. I”ll put them up in alphabetical order. The first one is of Jane Clarke, allegedly a married woman. We’ve met her before. Unfortunately I haven’t come across many photographs of the ‘Belfasters’. Ray has Jane marrying Richard Bushnell, a former convict, with whom she has nine children. The couple lived on the Darling Downs, Warwick and near Gayndah. 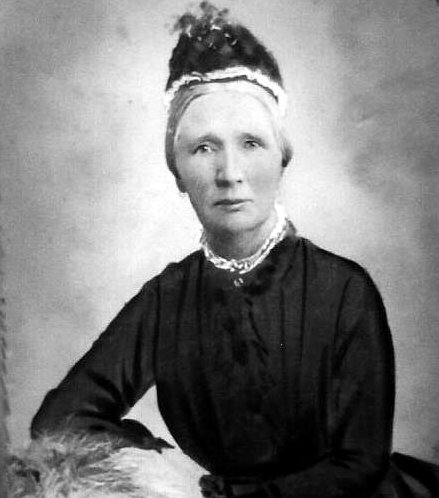 Jane died in Bundaberg in 1902. The next is a family reconstitution of someone with a famous name in Australian history, Eliza Frazer. There are another two probable children to the marriage. In July 1850 Eliza was a witness at the trial of John Brown charged with an assault on a young servant, Mary Maddox. Another witness, Mary Sparkes, describes Eliza’s part in the affair, “… I know the little girl–and I know the prisoner he lodges at Humbys–Last night I was filling the kettle and I heard someone screeching–I listened and knew it was the voice of Humby‘s girl–the man was not naked but his trousers were unbuttoned–he said to the girl Hush! Hush! and I’ll give you five or six shillings…felt hurt and called to Mrs Dwyer who came up and threatened to burst the door if he didn’t open it.–I remained at the back door–and Mrs Dwyer went to Mrs Humby and told her to be down quick for the girl was not being acted right by…” . One of the ‘feisty colleens’ indeed, as Ray calls them. 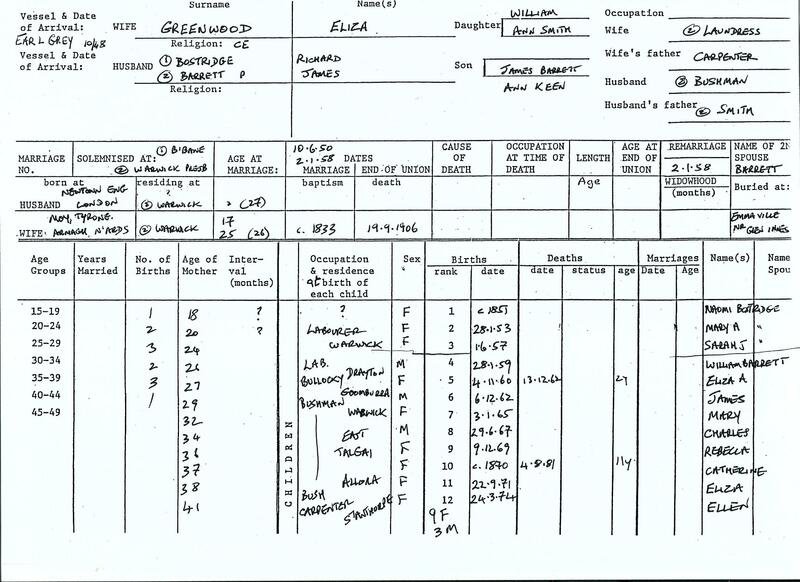 The next example is Eliza Greenwood. Note how far she travels during her lifetime. Not all the ‘Belfast girls’ were banished to Moreton Bay. Some went to Maitland in the Hunter Valley. 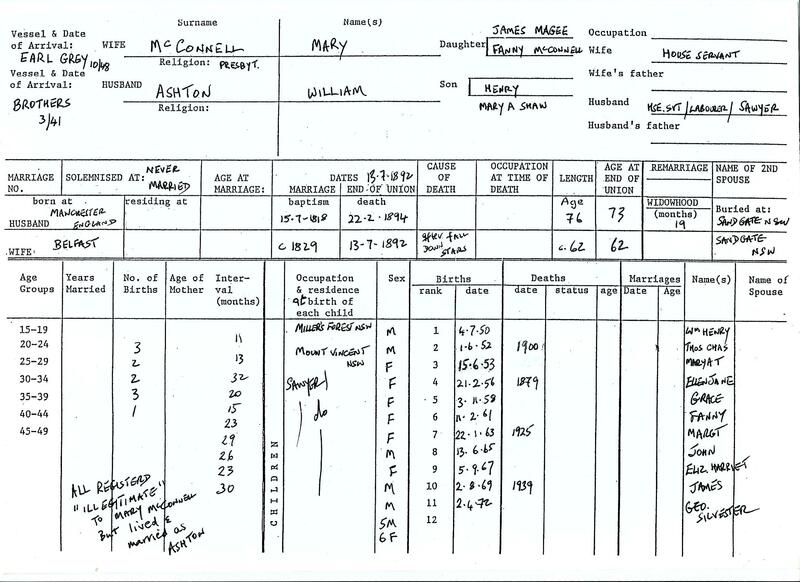 Here is one example, Mary McConnell, also alleged to be a married woman before she left Ireland. Mary never married her partner in Australia, William Ashton. 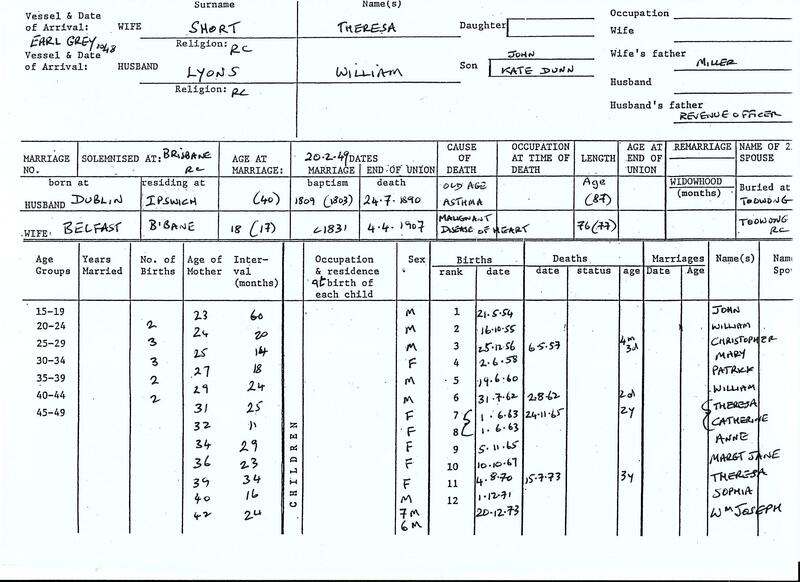 All her children were registered by her as “illegitimate”. Yet they lived their lives and were married as “Ashtons”. As always, my thanks go to descendants who gave me information and sent me photographs. In Mary’s case, my sincere thanks to Pat Evans and Brian Andrews. Maybe I can return to Mary’s family history at a later date? Finally, a family reconstitution for Theresa Short. Ray has discovered a possible fourteenth child. Not all the ‘Belfast girls’ had such large families and apparently stable relationships. Some such as Georgina Mulholland or Mary Black appear fleetingly on the historical stage but they are given another fictional life, this time in Jaki McCarrick’s play. May it be a scintillating success and play to packed houses. This entry was tagged Artemisia Theather Chicago, Earl Grey orphans, Eliza Frazer, Eliza Greenwood, family reconstitutions, Irish Famine orphans, Irish Famine orphans to Australia, Jaki McCarrick's "Belfast Girls", Jane Clarke, Maitland, Mary McConnell, Moreton Bay, Ray Debnam Feisty Colleens, Theresa Short. Bookmark the permalink. Hi Trevor my forebear Jane McGarry was one of the unsuccessful Irish Orphans, who died young of alcoholism at Dalby aged 35. Are you interested in what happened to her children. Two grew to adulthood and had families. Lovely to hear from you Beth. I’d certainly be interested in what happened to her children. I’m sure others too. On my ‘family reconstitution’ for Jane she had four children, one male and four females, one of whom died at nine months. The first two were born at Myall Creek. Her death certificate listed ‘exhaustion from intemperance’, 28.10.1858. Do you have an email address on which I can contact you directly with regard to a radio programme I am developing in Ireland based on the Earl Grey Scheme. When talking about the ‘Belfast Girls’ it should also be mentioned that when Earl Grey received the report from Governor FitzRoy he instigated an investigation into the allegations. In his reply to Governor FitzRoy in October 1849, it was shown that most, if not all the accusations were baseless. From some of the words used by Earl Grey in his correspondence you can sense he was not happy. You aren’t wrong there Kevin. My own view about all this is clear I hope from my introduction to Barefoot vol.1. I even quote from the CLEC report and Grey’s view in that, if memory serves. Douglass’s complaints, and attitude, nevertheless, had a lot of support in the colony. The orphans had a bad press here which contributed both to the ending of the scheme and continuing negativity towards the orphans. I’ll be coming to all that in a while, I hope. Nonetheless if you compare government reports, the Otway report from Belfast in 1849 and the NSW Legislative Council report in 1858, for example, they usually come up with the result they want. The Belfast orphans obviously gave Douglass a lot of strife on the voyage out. Jaki’s play is something else again. Enjoyed your article very much. My relative, Eliza Connolly was one of those “barefooted little country beggars, swept from the streets into the workhouse, and thence to New South Wales…notoriously bad in every sense of the word”, and sent to Maitland with 11 “notoriously bad” Irish Orphans under the number, Im Cor 50/659, 10 Aug 1850. Are you aware of a particular depot in Maitland the girls would have been sent to? How did they get chosen to go to Maitland from the Barracks in Sydney? I’ve been searching for sometime but have not come up with particular place or answer. I’ve emailed Dr Perry McIntyre about query but she is not sure either. 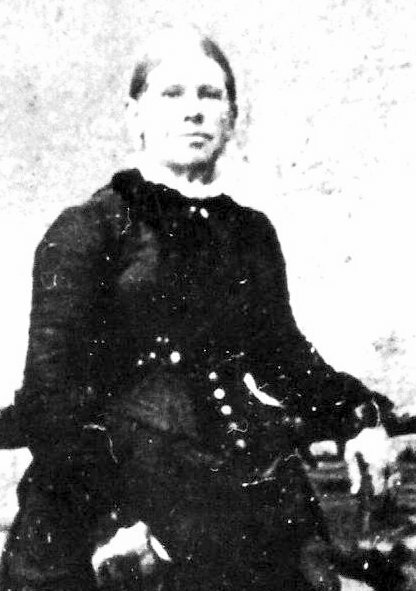 Eliza Connolly, from the Maria was sent as a housekeeper to widower John Roles Copper (with one child) in Wollombi, married him and had 12 children of their own. In that ‘quotation’, Surgeon Douglas was referring to the ‘Belfast girls’ who came on the first vessel. Not to others. You’d need to look through Merewether’s Immigration Correspondence for more info on Maitland arrangements. I suspect arrangements for migrants go way back to the early 1840s. There were cottages there for immigrants in Caroline Chisholm’s day, for example. Merewether was meticulous in making sure police constables accompanied the orphans when they were sent into the country and communicating with local police magistrates for arranging their accommodation. If an orphan had her indentures cancelled the thinking of the Orphan committee was that she be removed from Sydney. However, as the scheme progressed it became more and more difficult to find employment for the orphans. Those arriving on the later vessels such as the Maria had a greater chance of being ‘distributed’ throughout the colony. 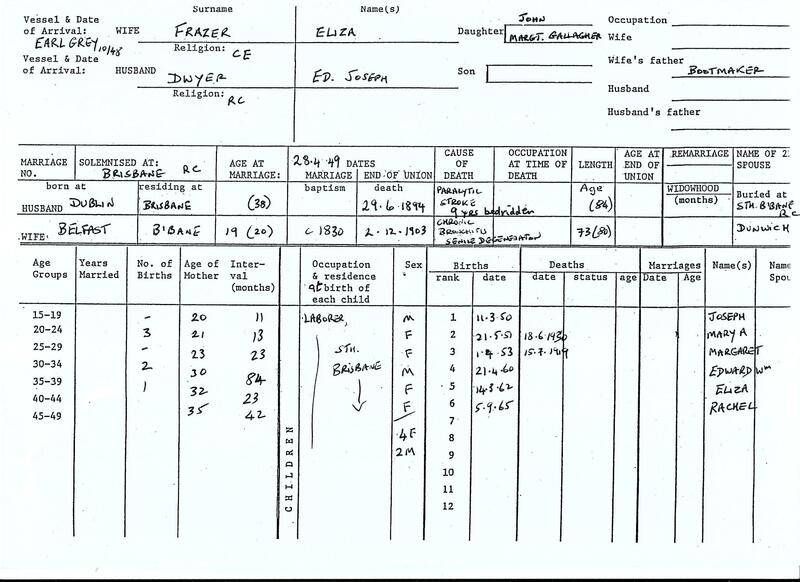 If Eliza was still in the barracks after 4 or 5 weeks–and to save money– the chance of being sent into the country was all the more likely. Earlier the PM in Maitland had asked for migrants to be sent there. And at 50/545 4 July it looks like they had decided very early to send some Maria orphans to Maitland, Goulburn and Moreton Bay–even before it arrived! I see no reference to the 12 Maria orphans to Maitland being described as ‘notoriously bad’. That Im Correspondence reference you cite is the one i put in Barefoot 2 (probably vol 1 as well ). If you go to page 140 of vol 2 which has the key to abbreviations you will find the exact reference re Merewether’s Immigration correspondence. It’s really well worth a trip to the archives. Best of luck with it.